Celebrating the 30th Anniversary of the Mega Man series with a remaster of the first game that started it all! Mega Man Remastered (formerly known as the Upgrade Patch) is a patch for the first Mega Man game, which enhances it in so many ways, without modifying the levels or graphics (minor graphics and palette changes, which are listed below). To those that are familiar with the Upgrade Patch, you could consider this Version 1.7 of it. · Mega Man's face on the titlescreen has been fixed. It was missing two pieces on the right side of his face. · Continue is now New Game, and Erase Data is now Continue, and they function as such. Data is no longer erased. If you want to start a fresh game, select New Game. If you want to load a previously saved game, select Continue. Remember, the game is saved after the completion of a stage, and when you obtain the special weapon in Elec Man's stage. The Wily stages are the only stages that are not saved. This allows you the ability to play through all of the stages in the game. · The gameover screen now looks more like Mega Man 2's. It was too bland before. · The cursors for the titlescreen and gameover screens have been updated. · My credits: 2014 RetroRain is now 2017 RetroRain. · Dr. Wily has been fixed on the stage select screen. His face was all black. This has now been remedied. · Besides the select button, the up and down keys can also move the cursor on the titlescreen and gameover screen. · The Ready text at the beginning of a stage now flashes. · If you fall down a pit or on spikes, your health meter will now show empty. It didn't do that in the original game. · You can now toggle obtained weapons with the select button. As such, the pause feature has been removed. But this is not a big deal, as the inventory screen doubles as a pause feature. · The score balls have been removed completely. · Newly designed Remastered logo for the titlescreen. · Converted to Mapper 4: MMC3. · Graphics format converted to CHR-ROM. · PRG and CHR ROM expanded to the new mapper's maximum limit. · The game now has the ability to save and load your progress. · Updated font for stage select and boss-preview screens. · Updated cursors for titlescreen and gameover screen. · Stage select screen has a new palette. · Boss-preview screen is now like Mega Man 2's, with the preceding flash to it removed. · Gameover screen has been updated to look more like Mega Man 2's. · Updated palettes for Cut Man and Elec Man stages. · Score and score balls have been removed from the game. 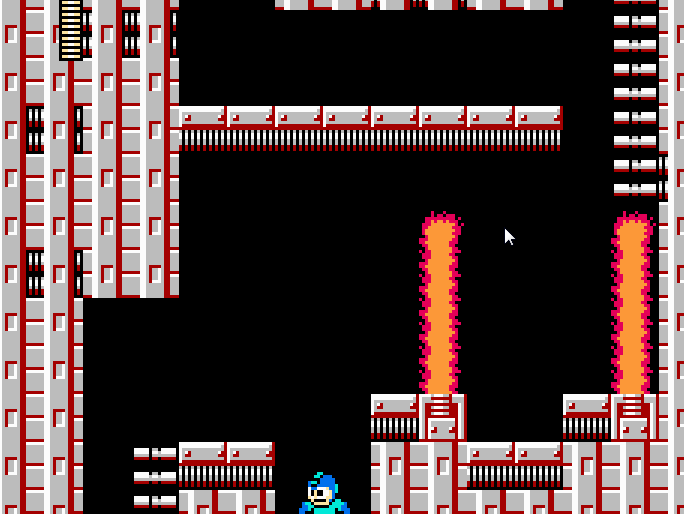 · Mega Man palette updates for three weapons: Ice Slasher, Elec Beam and Bombs. · Boss energy bars moved over to the right side of the screen. · Updated health and weapon capsule graphics to match those of the later Mega Man games. · Ready text has been updated: It now flashes, has a new font, and the time it is displayed for has been cut in half. · Up, down and select can move the cursor on the titlescreen and gameover screen up and down. · Falling down a pit or on spikes will display your health meter empty. · Select button toggles between obtained weapons (hence removing the pause feature). This patch is to be applied to the English version, Mega Man, not the Japanese version, Rock Man. This ROM was tested to work on FCEUX 2.2.2. I have not tested it on other emulators. You may use this patch as a base for your Mega Man hacks, just please give credit if you do. Why remove the score balls and hide the score system? Sure, it's a meaningless relic, but it's as much as a part of Megaman 1 as the score system in Super Mario Bros. 1. Without it, there's just something missing. Could you release another version that maintains the score system and score balls? "The menu acts like the pause" Can't aim with the menu onscreen. Can you make an alternate version with the japanese styled logo? Found a bug. When you change weapons using Select then enter a boss room, Mega Man's palette reverts to his default palette. No issues when you change weapon via Start Menu. That's precisely why it was removed. All the other titles after it don't have one, and it literally serves no purpose at all. That, and now that it is gone, it clears up the screen a little more. I'm sorry, I'm not going to re-add it. I don't know what you mean by that. The pause feature in the game is redundant, since the inventory screen doubles as a weapon-select and a pause feature. And, I have been asked in the past to make the select button toggle weapons. I see this as an improvement, especially if the pause feature was being used to exploit the game. I actually considered changing it to that. But when making this hack, I had to be careful in what I changed. I'm allowing people to use this as base for their hacks if they wish, and I didn't want to deviate too much from the original. I could have changed that logo, but some people may have liked the original or insisted on having it. The purpose of this remaster was simply to clean up the game and add some things to make it better, without drastically altering it and ruining the original experience. The score was removed because it literally serves no purpose, and it frees up the screen. Hence, I see that as an improvement. Thanks for pointing that out. I'm not sure why it's doing that, but I'll look into it. removing that score stuff at the top of the screen is the BEST possible thing that can ever be done to mm1 in my opinion...cause who cares about points... and that's 7 extra sprite tiles that add to the flicker ...on top of the 3 lifebars which are all 7 apiece. So basically with boss/life/weapon lifebars with 21 sprites .... that score thing at the top makes it 28 sprites. getting rid of the stupid score stuff is MUCH better in terms of sprite flicker/tiles. This hack seems really cool, I'll try it soon. Now though, I really wonder why moving the boss HP meter to the right of the screen has become a standard for hacks. It's no big deal, I can get used to it and I'm not going to sperg out over it, but I find it distracting and I really wonder why it's become a standard for hacks. As for switching weapons with select, it only works one way? Some hacks use "select" to cycle through weapons, "select+down" to cycle through them the other way, and "select+start" to switch back to the buster. Only being able to cycle through weapons one way ends up making waste more time than going through the menu, except maybe in the first few stages of the game, while something like I just described ends up more useful, faster, and have the advantage of being able to be set to shoulder buttons for people who play on emulators. I find the Select weapon switch convenient, but could the teleport animation when using it be disabled? It would make the game a little faster. I just gave it a quick try and it seems really cool, a really nice facelift that makes MM1 more on the standard of its sequel. Not to mention the added potential for other hacks with MMC4. However, is it just me or does the hack lag more than the original game? For instance in the first part of Ice Man stage, it felt to me like there is a bit more lag. If your goal is to make the game feel more like its sequel, I have a suggestion for water: add the 'water splash' effect when MM jumps in and out of water, as well as the air bubble coming out of his mouth when he's underwater. That would be nice. Also do you think you can animate the small HP and energy capsules? I've got a few things you might like to add to this. This is pasted from my patcher format, but easy to understand. Apply after your patch, without header. // and collecting energy in mid-air, and other sillyness. This block should use the graphics for platform top but it doesn't. 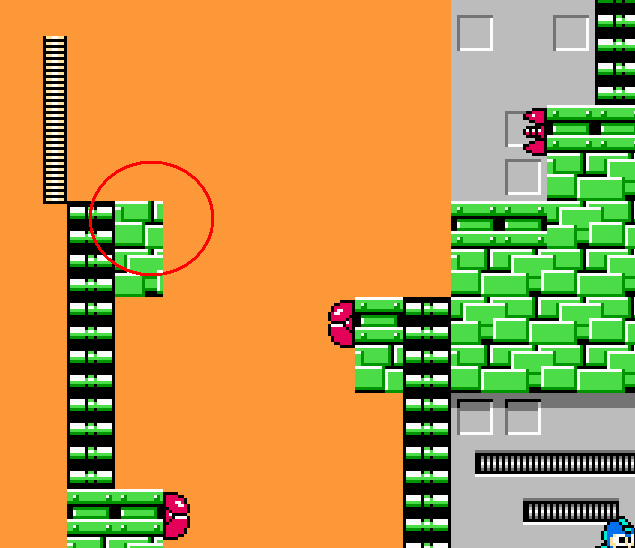 There's little things like this all over, like the ugly cut off floating platforms in bomb man stage, or many places where they don't use the under shadow for graphics that are designed to use one, resulting in an ugly lack of bottom border. * Remove the dumb spot in fire man stage that looks like a pit, but you can just stand there. You can't make it a real pit since this is a screen where you go down from, but maybe you should drop to the screen below (have to remove blocks on lower screen too). Otherwise just add blocks to make it obvious you can stand. This is a neat hack that you did, one idea that I have if you want to add it to your hack is give Mega Man and the rest of the cast MM9 & 10 style color palettes. I'm surprised you find it distracting. I find the opposite true. I always thought having the boss life meter right next to your own created some confusion. It just never made sense to me for it to be so close to yours, when it should be on the other side for better distinguishment. Unfortunately yes, it only works one way. I'm not about to go an implement a reverse cycle, because in all honesty, this weapon-switching thing was one of the hardest ASM hacks I ever had to do. It took me about 4 or 5 days to implement. I had to start over several times, and I had to modify and add code, and it was very frustrating. Definitely not a fun thing to implement. I could of made it so that Megaman didn't do that teleport animation, but I wanted him to do that. It was more of a stylistic choice. It reminded me of how Matrixz did it for his hack Mega Man Forever, and I like that hack, so I decided to go with that. Just think of it this way--The original had no way to weapon-switch with the select button. So this is definitely better than having nothing at all. It could be lagging, but I haven't really noticed it in a way that was bothering me too much. I'd have to compare the original and my hack to see if it that is true, but even if it is, I'm not sure what I could do about it. I certainly didn't intend on making it lag more, so I don't see why it would. Unless of course I wrote code in some free space that was meant to be left alone, but I'm not really sure about that. These would be interesting touches, but I honestly don't want to go any further with the project. Two reasons--I burnt myself out working on this hack the past week (eye strain), and I have real-life stuff to attend to. I can't spend anymore time on this hack. Zynk pointed out the same thing--the palette bug with the weapon switch. I will release another version when I have fixed it. But it won't be right away. Maybe a week or so. I have to stay off the computer for a little while, and as I said, real-life stuff. I know what you mean about the blocks in the levels. I have OCD, and I'm a bit of a perfectionist, so I know where you're coming from. But one of the decisions that I made, was NOT to touch the levels at all. When doing a hack like this, you have to be careful what you change. Optimize, but do not taint the original. I only changed the palettes of two stages because A. They were much better changes, and B. they brought more color variety and balance to the game. As for the code, I don't intend to do anything more with this project. Does the Remastered logo look okay? Should I narrow the spaces between the letters by one pixel, or leave it alone? It was just something that was bothering me, but it's not a big deal. When I have a chance, either towards the end of the week, or next week, I will release another version (Version 1.1), fixing that weapon-switch palette bug. Thanks for your interest in the hack. This looks pretty cool. I just recently beat MM1 in MM: Wily Wars. Someone on another site is working on an unofficial MM: Wily Wars 2, but they are trying to do mm1-10. Honestly, I think the programmer over there is planning way too much and will probably abandon it. Seems to be what happens when people plan out these complicated changes and patches before they realize how difficult and long it will take. Changing weapons in-game is a pretty neat option. That always kind of bugged me since I could switch upgrades in MMX just using the R-trigger. Glad I could use save states it took me awhile to beat the game even with SS since I couldn't remember the bosses weakness during Wily Tower lol. Also, that yellow blob Yellow Devil caught me unexpected. Not sure if the select trick with elec man weapon is disabled in Wily Wars or not, but I couldn't master it. Well, at least Megaman portrait from the JAP logo is in the title screen. I think the spacing is just Dr. Right. Agreed. The logo looks fine to me. Just tried this last night, and it doesn't work on the Everdrive, or in Nestopia (says "CPU jam!"). I checked the CRC and it matches up. It would take some considerable doing, but I hope someone someday can make an NES conversion of the PSP remake, Powered Up. I'm not expecting playable bosses and the stage editor, but Powered Up considerably improved the level designs of all stages, added Oilman and Timeman to increase the boss roster to eight like every other Megaman game, and added that intro stage. There are sprites out there from the Rockman 8 FC project for Oilman and Timeman as well as their weapons. The grunt work would need to asm coding to fit it together. Does this fix the insane falling speed you get when you fall from or walk off some surfaces, like the moving platforms on Gutsman stage? There are two other known bugs in the game besides the weapon palette one. I'm not sure if it is those bugs that would be keeping the game from running on those other two devices, but you never know. On Wily Stage 1, when I got up to the area where those small hopping robots are (two screens after the flames), toggling the weapons around there caused the game to crash. And this other bug (which is minor), I may be able to fix (although I would have to go through hell to fix it), is when you have the Gutsman weapon equipped, and you have a block flashing that you are going to throw, when you cycle through the weapons, the flashing graphics change because of the change in the CHR page. I will look into fixing these things soon. I gotta be honest with you--I didn't like MM Powered Up. And it wasn't because of the things you mentioned. I've heard a lot of people praise the game, and that is just fine if you like it. But the main thing that really put me off about that game, which is why I never bought or played it, was the stupid cutesy graphics. Why couldn't Powered Up be done the same way Maverick Hunter X was done? Why did they have to make all of the characters "cute"? I simply didn't like the art style of the game. Period. Is that enough to justify not playing the game? I've always been about gameplay before graphics, because it is gameplay that makes a game. But I felt strongly that it was a stupid decision, and that style was very non-Megaman like. So I decided to pass the game up. I think the question is, why hasn't anyone hacked the graphics in MMPU? Seems to me, and this opinion is completely uneducated, that it shouldn't be difficult to simply replace the models for ones with proportional heads or just entirely new ones. The rest of it is just texture replacement. They already have classic graphics in the game that can be swapped out. As for Remastered as a base for a MMPU remake, I wouldn't even think of recreating the chibi graphics style of the original. When I was doing this very project as a hack of MM5, I was only concerned with implementing the new stage graphics in the style of the classic games. 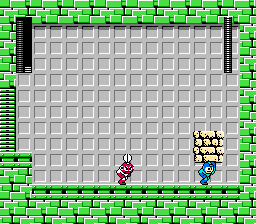 Everything else was going to be exactly as it was in MM1. Now that it is a PC remake instead, I'm also going to have many of the features that were in the PSP version, but still sticking with the style of the original NES games. Admittedly, in the back of my mind I'd still like to use Remastered and add the 2 extra stages, Oilman, Timeman, their weapons, their new stage hazards, and the new enemies not found in the original. Alas, my knowledge of the inner workings of MM1/Remastered isn't that great and I don't really have time to make a hack and a fan game.